*Estimated shipping and handling rates are for UPS/FedEx Ground Service or USPS Priority Mail to the 48 contiguous states only. Rates will vary depending on items shipped, package size, number of packages and destination zone. Additional shipping and handling may be required for oversized packages and shipments. Any additional shipping required will be added to invoice after checkout. Orders to Alaska, Hawaii and Canada are shipped either by UPS/FedEx Ground Service or USPS Priority Mail (depending on the items shipped), and will incur actual charges based on items shipped, package weight, size and destination zone. BluebirdLanding.com ships within the United States of America with limited shipping to Canada addresses. Canada customers have the option of having us ship your order directly to the shipping address provided via International Priority Mail, or using Bongo International package forwarding service. Shipments to Canada locations will incur actual shipping and handling rates, in addition to customs fees and surcharges. Orders are promptly processed and shipped within 1-2 business days directly from BluebirdLanding.com warehouse located in Missouri. Some products are shipped directly from the distributor or manufacturer. Handcrafted or custom made items may require additional time for shipment. Orders received before 12:00 pm CST are processed the same day. Orders received after 12:00 pm CST are processed the next business day. We do not ship on Saturday, Sunday or holidays. If any items are on backorder, the order will be shipped when backordered items are available. Please note that all items ordered may not necessarily be shipped together. Some orders may arrive as split shipments from more than one warehouse location. Packages may be shipped and arrive on different days. We will notify you by e-mail, so that you are aware of any split shipments, if they occur. Ground shipments to Alaska, Hawaii and Canada - The exact cost of shipping based on package size, weight and destination zone will be determined before it is added to your order. After we receive your order, we will calculate the additional shipping costs, and contact you by e-mail to confirm these costs prior to shipment. If you have questions regarding shipping to your area, please contact us. Note: Live Insects/Worms and some organic based products cannot be shipped to Hawaii or Canada due to agricultural restrictions. Oversized Shipments/Additional Shipping Required - Extra shipping charges will be added to the invoice after checkout if any of the following apply: 1) items and/or packages are dimensionally oversized, this includes weight and measurement of items and/or packages; 2) when order shipment requires multiple packages; 3) shipping to Alaska, Hawaii or International locations; 4) Live Insects/Worms - additional shipping charges will apply when ordering multiple insect/worm boxes or packs, or when combining other items from our store on the same order. Shipping charges will also be added to invoice if customer selects incorrect shipping method at checkout; for example, selecting 'Ground Service' when live product item ordered requires 'Overnight Service' shipping method. Customer will be notified by email when additional shipping charges are required or added to their invoice. If additional shipping charges cannot be added to the invoice because of customer's credit card declining the transaction, or, if customer does not submit payment requests through PayPal, we reserve the right to cancel the order and refund customer for order total less cancellation and processing charges. Items Temporarily Out of Stock - Items temporarily out of stock will be placed on backorder, if they are expected to arrive in our warehouse up to six weeks from the time the order is submitted (see order cancellation and backorder policy details below). Customer may be notified if an item is temporarily out of stock. If customer does not respond back to email notifications requiring reply, we reserve the right to substitute a similar item in our store, or issue credit. Discontinued Items and Product Changes - If a manufacturer discontinues a product SKU or model number, replaces it with a new item that is the same or closely similar, changes the product packaging, makes slight changes to product content, or improvements to product design, we reserve the right to use our discretion and make a substitution on the order. If a similar or like item is not available to substitute, the order may be cancelled and the customer notified. If customer is not satisfied with the item received they may request return authorization within 10 days of delivery (See store Return Policy). Restocking fee will apply and customer is responsible for return shipping cost. Order Cancellation – All orders submitted in our online store are immediately processed for shipment and cannot be cancelled. Any customer wanting to make changes to an order must contact us immediately. There are no guarantees that adjustments or changes can be made in time before an order is pulled in our warehouse, packaged and shipped. Any backordered items that have not been shipped may be cancelled; however, there is a cancellation fee of up to 25% based on order total which includes order processing. Cancellation requests of any unshipped backordered items must be in writing and emailed using our contact us form. All live insect and worm orders cannot be cancelled (no exceptions). The same applies to orders for custom handcrafted and hand painted items that may require additional time to prepare for shipment. Backorders - If an item is temporarily out of stock and expected to arrive in our warehouse within a few days, or in some cases up to 6 weeks or longer, we reserve the right to place the item on backorder and ship it as soon as it arrives, or substitute a similar item. Customers are notified by email of their order status, if backorders are necessary. Backorders are not common, but may occur at any time especially during busy seasonal times of the year, or if an item is temporarily sold out or new. If the delay in shipping is expected over four weeks customers are notified by email and given the choice to continue waiting for the item, substitute another item in our store, or cancel the order and receive credit less order cancellation fee. If an item is both out of stock and discontinued, we reserve the right to substitute a similar or like item in our store. If no such item is available customers may be notified of the availability status by email and given the choice to cancel the order, or select another item. If customer does not respond back, we may substitute a similar item in our store, if available, or issue credit. Refusal of Package Delivery: No credit will be issued for any order shipments (packages) refused by the customer (receiver) and returned to our warehouse. This also applies to replacement product and/or part shipments for damaged or defective items received. If a customer refuses delivery of replacement products or parts, no credit will be issued for the original order. Undeliverable Packages: Packages that are returned to our warehouse and cannot be delivered because of incorrect or insufficient shipping information provided by the customer will be treated as a returned item (see store Return Policy). The same is true for packages that are returned because no one is available to take delivery or pick up a package. We may contact customer by email and arrange to re-ship the package(s) if correct shipping information is provided. It is very important when completing your online that you double check to make sure the ship to address information you provide us is complete and accurate. Delivery Correction Fee - If a carrier is unable to deliver a shipment because the address provided by the package recipient is incorrect, they will attempt to determine the correct address, complete delivery and notify us of the address correction. A special handling fee will apply for delivery or attempted delivery to the corrected address. This fee can amount to $15.00 or more depending on the number of packages and destination zone. It may take up to 60 days for this fee to be added to your invoice. Again, it is very important when completing your online or call-in order that you double check to make sure the ship to address information you provide us is complete and accurate. Shipping Information Provided by Customer - We reserve the right to place orders on hold if a customer does not provide us with correct and verifiable shipping information including name, street, city, state, zip code. Customers must provide us with a valid email address so they can be contacted by our shipping department. If a customer does not respond to our email notifications, order will be cancelled and payment refunded less order cancellation and processing costs. BluebirdLanding.com standard shipping methods within the U.S. and Canada are UPS, FedEx, or U.S. Postal Service Priority Mail. Shipping time is normally 2-6 business days depending on shipping destination zone in the U.S., 6-10 days or longer for shipments to Canada. Shipments to Canada are normally sent via Postal Service Priority Mail only. UPS/FedEx requires a physical address and does not deliver to PO Box addresses. Orders sent to PO Boxes ship via USPS Priority Mail with delivery confirmation. If only a PO Box is listed as the ship to address on an order, you may be contacted to provide us with a physical street address for UPS or FedEx delivery. 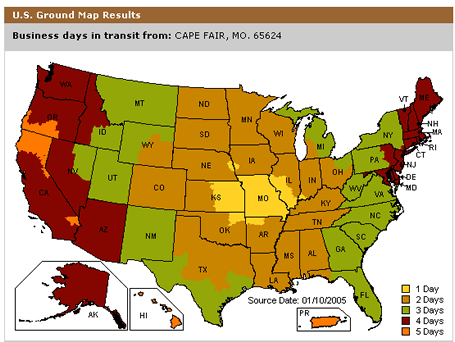 See the map below for typical total order processing and UPS or FedEx ground delivery time estimates within the U.S. Please allow additional time for delivery during holidays, or shipments to Canada (6-10 days). You will receive an automated e-mail confirmation immediately after you place your online order. Please save your order confirmation e-mail! Please include your order tracking number (if available) in all e-mail correspondence. Also, include your full name and shipping destination address. Once you order is shipped you will receive a second e-mail confirmation including UPS/FedEx package tracking information, as it becomes available. Normally, your order ships out from our warehouse within 1-2 business days. UPS/FedEx tracking information is not updated until the package reaches a regional hub where it is scanned. Please contact us if you have questions or need help tracking an order. • Do not throw anything away! Keep all items, boxes, and packing material shipped to you for inspection. • You may be contacted by the package carrier to inspect the damaged shipment, or you may be required to take the damaged shipment to a carrier facility, or your local post office for inspection. • Hold on to defective items for up to 15 business days in the event a return tag is issued. • You may be required to return a defective or damaged item back to our warehouse for inspection. • A replacement of the same or similar item will be shipped at no charge (no refunds or returns allowed). • If package delivery of replacement products or parts is refused by customer, no credit will be issued for the original order. Disclaimer: Product descriptions, dimensions and images are subject to change. BluebirdLanding.com cannot be held liable for discrepancies. This information is provided to BluebirdLanding.com by the product manufacturers. If you have questions, please contact us.